If you’re getting ready for that big vacation or business trip abroad and suddenly realize that you don’t have the right visa or that you need to renew your passport, don’t worry – Passport Depot is here to help. 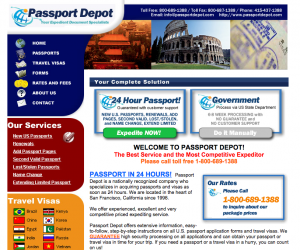 Instead of waiting the six to eight weeks that it normally takes during the peak travel season of the year, Passport Depot can have your new or renewal passport or visa in your hand in as little as 24 to 48 hours. They’ll collect your application and processing fees on your behalf and will submit them through the appropriate channels. They can have your documents back to you in as little as one business day so that your trip isn’t delayed for any reason.